Somehow National Hot Chocolate Day landed on #thirstythursday and during one of the coldest days we will see all winter in Chicago! 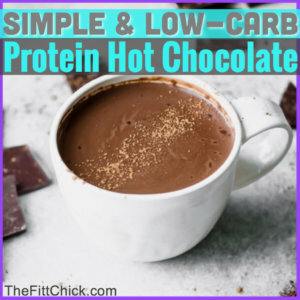 I LOVE hot chocolate, and this recipe is perfect for any healthy eating program you may be following! 1. place your chocolate milk and cream on the stove on low heat! 2. While your milk is heating, place the rest of your ingredients in your blender. 3. Once your milk is HOT, pour into your blender and mix until well combined and frothy! 4. Serve with some shaved chocolate and sip away! Add a scoop of Ancient Nutrition collagen for extra protein! Are you ready to DRINK YOURSELF SKINNY?